Aniyia explains how headphones are a natural extension of oneself and how she is driven to integrate them into fashion. Through her story of creating Tinsel, Aniyia encourages the audience to find their individual superpower, connect the dots and be resourceful in executing their vision. Video shot by Christie Goshe and Jessica Jones, edited by Jessica Jones. 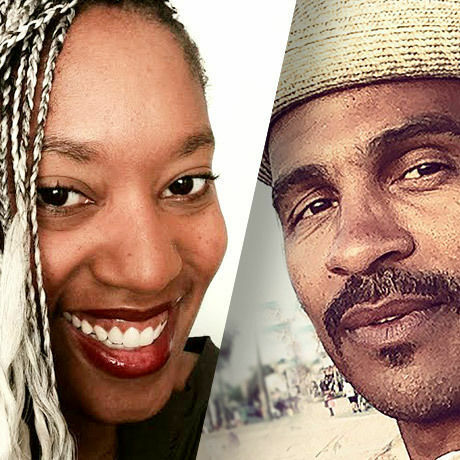 We’re so excited to bring 2 speakers to CreativeMornings Oakland this month to mark our 2 Year Anniversary! Aniyia founded Tinsel in response to the lack of tech products developed with women in mind. After coming up with the idea of an audio accessory that doubles as a beautiful piece of jewelry, she decided to leave her role as Head of Marketing with Voxer in 2014 and build create the company. Her unique background in tech and the arts spans beyond marketing into brand building, community management and business development. After a decade of training as a singer of classical music and opera, and time spent fundraising major gifts for Wolf Trap Foundation for the Arts and the Levine School of Music, she joined the mobile messaging startup Voxer as a Community Manager and worked her way to leading the Marketing team. Aniyia is also currently on the board of audio engineering non-profit Women’s Audio Mission. Keba Armand Konte has been in Oakland long. He is an artist, food entrepreneur and community man. His artwork has been published widely and exhibited in museums and galleries internationally. He is the co-founder of Guerilla Cafe, founder of Chasing Lions Cafe and Founder/Roaster for Red Bay Coffee Roasters. In his spare time he enjoys aquaponic gardening, judo and making vegan waffles for his family while listening to ol’ time singer Valerie June.